A beautiful example by Naadeyah Haseeb, author of MANIC DEPRESSIVE DREAM GIRL. Going through my old files from high-school and college, I found a sealed envelope labeled "for future Mel," which I guess is me, because I guess this is the future. Inside I found cut-aparts of old college poems, poems so old I didn't really remember them, or their chopped-to-bits parts. So I spread them on my desk. 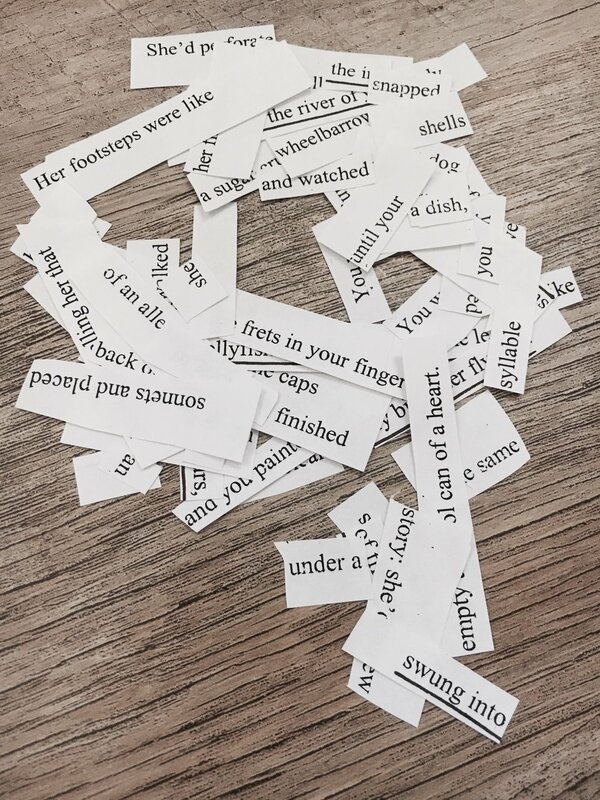 Sorted them into vague "yes you are a poem" "no you are not" piles. I further diced some fragments. Detached compound words. Stole articles. Threw more than 50% away. I can't help it when I see a puzzle in front of me. I want to build it, rearrange it, make it whole. A found poem is certainly constricted by its source material. Maybe that's what I love most about it. It is bound to its bones. It is an exercise in trust and flexibility. Found text has a special sort of whitespace phenomenon - it's clear it's borrowed; it's clear it's a small part of something more. It's beautiful the way closeups are. It's marred as burnt toast. It feels honest, even as it's withholding. Like it's wearing revealing clothes. Going through my old poem scraps, shuffle-building, rearranging, I feel like a hoarder - I want to keep and keep even if it isn't in service of the best poem. I loved "fly bite after fly bite" - and I must have loved it when I wrote (it was underlined). I kept the "empty aerosol can of a heart," even if maybe it's too jarring jumping from a dish of moon or sugar-crusted wheelbarrows - if it feels too metallic compared to the lush naturalness of the previous imagery. I wanted to have "you full of violets" even though the clause didn't have much to cling to. I think I love found poems because they are messes, because it's me untangling their hair.